Consistently getting 10 to 11 hours of uninterrupted sleep at night. Regularly making their morning naps shorter or sleeping too long in the morning and then refusing the afternoon nap. Often taking longer to fall asleep for morning naps. When your toddler has reached these milestones consistently for at least 10 to 14 days, the time is right to begin the transition to one afternoon nap. Be careful not to mistake one shortened morning nap for a sign your child is ready for this change. If your toddler isn’t ready, don’t force it! It can be tempting for parents to cut out a nap for convenience, but you both will pay the price later at bedtime. Once you’ve made sure your child is ready for this transition, make sure you are, too! Don’t try to change their whole routine the day before you leave for vacation or when you’re under a deadline at work. Begin by gradually pushing morning naps later (around 11 a.m. for two days, then 11:30 a.m. for a few more days, then noon, and so on). Move slowly until the afternoon nap starts between 12:30 and 1 p.m. and ideally lasts for approximately 2.5 hours. It’s best not to transition to one nap until your toddler is sleeping through the night consistently for a few weeks. 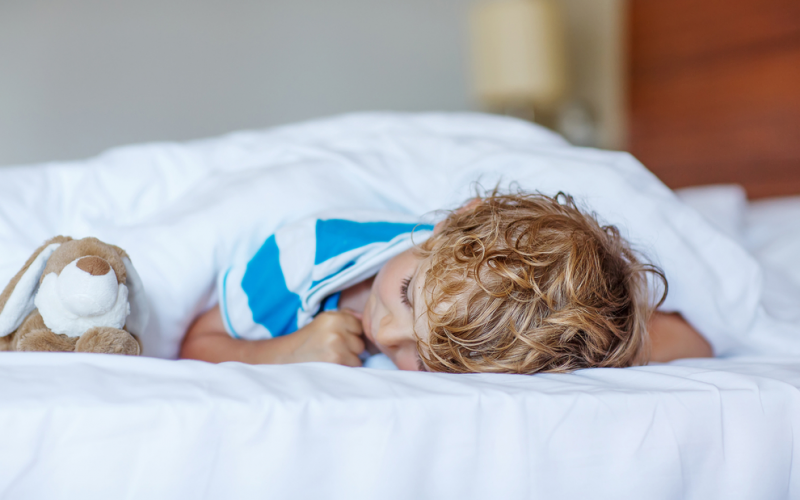 To avoid an overly tired child, try to get your toddler to bed earlier than usual for two weeks or so during the transition, at around 7 p.m.
Don’t allow your toddler to sleep past 4 or 4:30 p.m. If your toddler sleeps for only an hour, try to soothe and resettle him or her back to sleep. If all else fails, you can use one of your emergency techniques, like putting the toddler in the car or stroller for an additional nap. Allow some wiggle room, and be open to an occasional two-nap day. It’s okay to let your child nap twice, just limit the morning snooze to 45 minutes. Even in the best-case scenario, be prepared for your toddler to be cranky and out-of-sorts for two or three weeks. Most toddlers are ready to give up their morning nap between 15 and 18 months old. Gradually move their morning nap later and later. Avoid overtiredness by encouraging an earlier bedtime. Anticipate some crankiness as they transition.